Virtual School Resources: Knowledge Box Central Celebrates Independence Day! Knowledge Box Central Celebrates Independence Day! Knowledge Box Central is the home of the $5.00 lapbook! Choose from character building, American Girl, and more, including a book that is just for summer fun! There are even lapbooks especially for preschoolers! Don't forget to add to your school year curriculum to supplement your studies of state history, biology & chemistry (to be used with Apologia!) and so much more! Knowledge Box Central is celebrating Independence Day by giving away FIVE lapbooks to one of my lucky readers! Come back on Wednesday, July 4th to enter to win these 5 books in the Made In America Giveaway Hop going on through July18th! 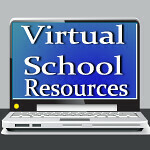 Be sure to subscribe to Virtual School Resources so you don't miss any of the great giveaways planned for this summer!